The Solstice Discovery Service (SDS) is an IT-friendly, non-broadcast mechanism that allows users to discover and click-to-connect to Solstice displays from their own devices to start sharing content. Without SDS, users on networks that don’t allow broadcast traffic will be required to enter Solstice display IP addresses each time they want to connect. We realize not every network allows broadcast traffic, so we built the SDS to make connecting to a Solstice display fast and easy for all users. If you want to enable one or more of these capabilities in your Solstice deployment, then you need SDS! The Solstice Discovery Service is a free software that must be installed on a Windows computer or server attached to the same network as your Solstice Pods and Windows Software hosts. Each Solstice endpoint is configured (either en masse via the Dashboard or individually through local/web configuration panels) to publish their information to the SDS directory on the SDS host machine. Users point their client applications to the same host machine’s IP address, or they inherit the SDS setting from the first display they connect to, in order to see every available Solstice display listed in the SDS directory. The result is the easy click-to-connect experience without the network congestion or security concerns associated with broadcast traffic. SDS uses lightweight TCP/IP packets over ports 53200, 53201, and 53202. You must install SDS on a Windows machine with a static IP address. This can be a PC running Windows 7, 8, or 10, or a Windows Server running 2008 R2 or 2012 R2 with qWAVE (Quality Windows Audio Experience) installed and a quad core processor with a minimum of 12GB RAM. QWAVE is typically pre-installed on Windows PCs but may need to be installed manually or registered on a Windows Server. A Windows 2016 Server may be used if desktop experience is enabled. Though many deployments use the same computer for SDS and the Solstice Dashboard, that is not required. Best practice dictates that the host computer be a domain controller with IP routes to all subnets that have Solstice displays deployed on them. For a standard installation, the SDS host machine requires a static IP address because the Solstice displays and client applications will use this IP address to communicate with the directory. For an advanced installation, see the “Optional: Network Routing SDS Override” section below. Both the Solstice display software and the Solstice client software communicate to the SDS periodically using lightweight TCP/IP packets over network ports 53200, 53201, and 53202, which will need to be allowed through the host machine’s firewall and on the network. The download/installation location is not important to the functionality of SDS, so move the file to the most appropriate place in your file system, or leave it where it is. Run the file and follow the dialog steps to install SDS. After installing SDS, the next step is to get your displays and users Solstice apps all pointed to the SDS host. If you already know the static IP address of the machine with SDS installed, move on to Step 2. To find your IP address, open a Command Prompt window and type ‘ipconfig’, then hit your Enter key. You can find the IP address in the results that appear, as shown below. If you are not using the Dashboard to manage Enterprise licenses of Solstice and/or only have a few Solstice displays, you can update each Solstice display with the SDS host information individually. Open the configuration panel for a Solstice display. Check the box for Publish display name to Solstice Directory Service. This is not exclusive of broadcasting the name, so it is fine to leave both boxes checked. In the SDS Host 1 field, enter the host machine’s IP address, then click Apply. Note that there are two SDS host fields available. A second SDS host can be listed for a Solstice display that is attached to two networks via Solstice’s dual-network mode. This supports collaboration among users on separate primary and secondary networks, such as a main corporate or campus network and a guest network. Displays attached to two networks will require an SDS host machine on each network in order for users on both networks to utilize all the benefits of SDS. If you are using the Dashboard to manage your Enterprise Edition Solstice licenses, you can easily provide the SDS host IP address to many Solstice displays at once. Enter the IP address of the host machine then click Set. The SDS tab’s icon will turn green once a connection to this host has been made. Select the Solstice displays you want to add to the SDS directory from your list of Solstice instances (use CTRL+click or SHIFT+click to select multiple displays). In the Display Discovery section, select the List display to Solstice Directory Service checkbox. Note that there are two SDS host fields available. A second SDS host can be listed for Solstice displays that are attached to two networks via Solstice’s dual-network mode. This supports collaboration among users on separate primary and secondary networks, such as a main corporate/campus network and a guest network. Displays attached to two networks will require an SDS host machine on each network in order for users on both networks to utilize all the benefits of SDS. 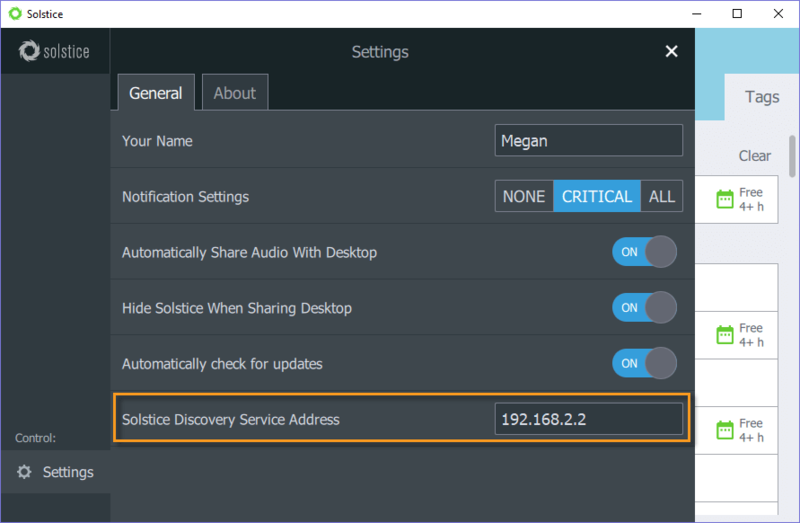 To see Solstice displays listed in the SDS directory, each user needs to enter the SDS host IP address in their Solstice app’s Settings menu. This is a one-time configuration. After entering the SDS host, the user will be able to see Solstice displays available for connection every time they open the app. Alternatively, SDS will be automatically configured for users that connect by navigating to the display’s IP address – unless the device already has another SDS IP address entered. In this case, the original SDS IP address will not be overwritten automatically. However, it can be changed manually in the Settings menu of the user app (Settings > General tab > Solstice Discovery Service Address field). Users are never required to enter an IP address to connect to a display. Instead, any user with a Solstice client will see a dropdown list of Solstice displays and can click to connect. Visiting users whose client SDS has already been set for a different network will still discover the SDS on a network that has been configured with the SDS override. Option One // The DNS administrator creates a ‘solstice_customer_internal’ domain zone and adds an ‘A’ record which maps the name ‘solsticediscoveryservice.solstice_customer_internal’ to the IP address of the machine where the SDS is installed. Option Two // Solsticediscoveryservice is an unqualified host name because it does not include a domain name such as ‘mersive.com’ or ‘university.edu’. By leaving off the domain name, we give the client operating system the option of appending the local domain name. This allows the IT department to add an SDS record to their name server using a proprietary domain name, e.g. university.edu. This record is added to the existing zone so that there is no poisoning of the customer’s DNS with a ‘mersive.com’ zone. For this to work properly, the client operating system needs to automatically append the local domain name when resolving the host name, so that the DNS can match it to its record. 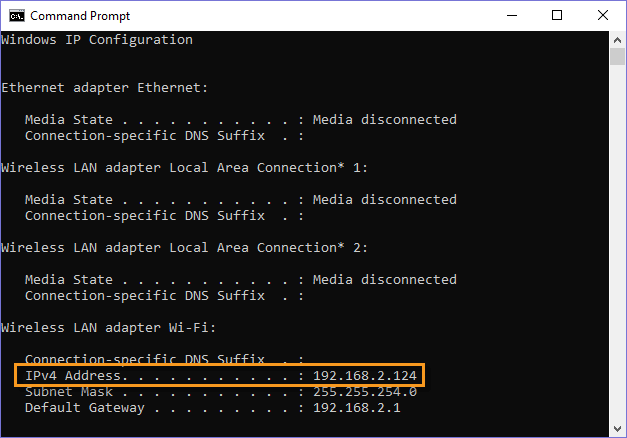 This can be accomplished by configuring the DHCP server (typically a wired or wireless router) to provide the default domain name to the client device when it provides the IP address for the device. Devices should then append this domain name to host names when attempting to resolve the host name to an IP address. NOTE: Option Two does not work correctly on Android devices because the Android OS does not automatically add the domain to an unqualified name. We expect this to be fixed by Google eventually. In the meantime, please use Option One if you expect Android clients to connect to your Solstice displays within your organization. Alternatively, Android devices can always connect by typing in the IP address of the Solstice display host computer. This direct network routing override method does not require the same IP address-related setup steps as the standard installation. If SDS is active and correctly routed on the network, the Solstice Dashboard will indicate this by changing the SDS tab logo from dark grey to bright green. By clicking on the SDS tab, the set of displays that are being added to the SDS and published to client devices on your network can be viewed. 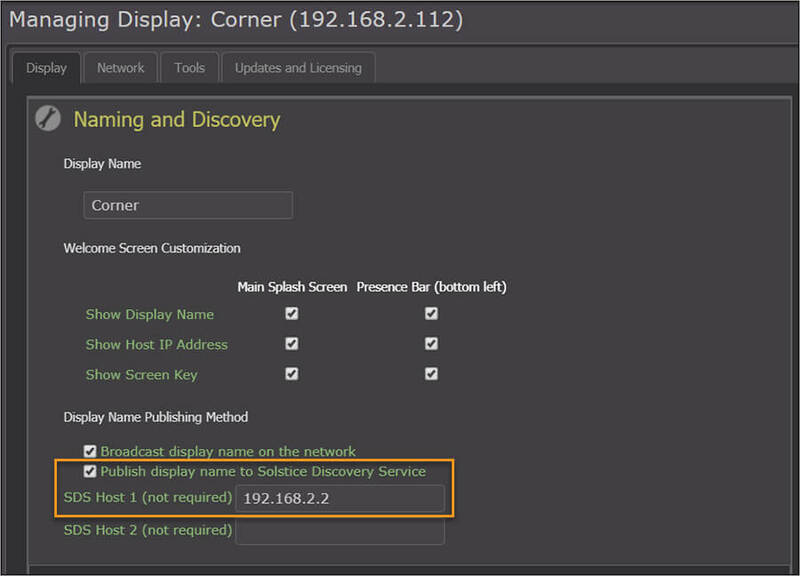 Displays can still be added or removed from the SDS on an individual basis by checking or unchecking the Publish display name to SDS feature on the configuration panel’s Network tab. Both the Solstice Pods/Windows displays and the Solstice client software communicate to the SDS periodically using lightweight TCP/IP packets over ports 53200, 53201, and 53202, which will need to be allowed through the host machines’ firewalls and on the networks. Active displays periodically provide an entry to the SDS that includes their current display name and a corresponding IP address. Likewise, client devices will receive a list of available displays from SDS at connection time, allowing users to see and simply click the desired display to connect. The corresponding IP address is then used to facilitate connection between the client and display. Displays and clients will automatically attempt to resolve the IP address of the SDS using either of the above methods. No special configuration of the display or client is required. Q: How much does SDS cost? A: Nothing! SDS is free to download and use. Q: Can I use a Virtual Machine environment for the Host Machine? A: Yes, SDS is supported on Windows Server 2008 R2 and Windows Server 2012 R2. Q: Do I need to update SDS to use Multi-Room? A: Yes. Solstice devices (Pods and Windows Software) must be updated to 3.0 software and SDS must also be updated to 3.0. The newest version of SDS is always available from our downloads page. Q: Why are there two SDS Host fields? A: Solstice supports users on primary and guest networks to collaborate in the same meeting via the Pod’s dual network mode. The two SDS host fields allow Solstice displays in dual-network mode to be listed to SDS directories on both networks in order to provide all the benefits of SDS to both primary and guest users. Q: I thought it was called ‘Solstice Directory Service’? A: SDS changed from ’Solstice Directory Service’ to ’Solstice Discovery Service’ in summer 2017. The two terms are used interchangeably in documentation. The host names ’solsticedirectoryservice’ and ’solsticediscoveryservice’ are both valid as of July 2017, with precedence given to the latter. Q: Can I affect how long displays remain listed in SDS after a Pod goes offline?